Udai Vilas Palace, Udaipur, City Palace, Jaipur and Hawa Mahal, Jaipur, Amber Fort, Jaipur these are only a few name to take. Colour is very integral to heritage of Rajasthan and rightly aligns to spirit of heroism and romance in Rajasthan. The state is harbinger of traditional colourful art of block prints, tie and dye prints. Handicraft items like wooden furniture and crafts, carpets, and blue pottery are commonly found here. The rich and varied folk culture in classical music and danced in its distinct style is symbolic of heritage of Rajasthan. Fostering wildlife is another feather to Rajasthan and is also noted for its national parks and wildlife sanctuaries as Keoladeo National Park of Bharatpur, Sariska Tiger Reserve of Alwar, Ranthambore National Park of Sawai Madhopur, and Desert National Park of Jaisalmer. Upon arrival, transfer to the pre-booked hotel for check in and night stay. After breakfast guided visit to Mahatma Gandhi Memorial, Humayun's Tomb, india Gate, President's Palace and Qutab Minar. 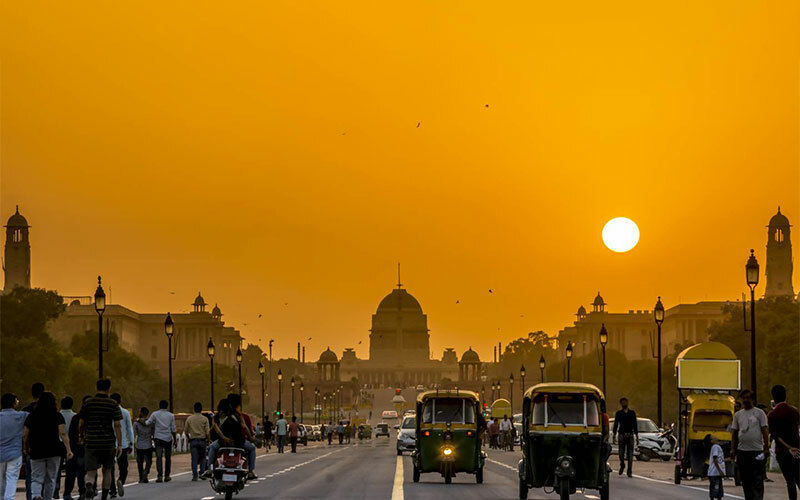 In Old Delhi visit Red Fort, Jumma Masjid and Chandni Chowk (Silver street). Today we drive to Mandawa, the capital of Shekhawati region of Rajasthan and world famous site for its old havelies and fresco art. Enjoy the village walk and see how the earthen potteries are made by Indian potters. Bikaner was founded in 1488, 29 years after Jodhpur by the younger son of Rathore Raja of Jodhpur. Rao Bikaji was given an army and asked to seek his own fortune to avoid a war of succession. Thus Bikaner was founded in heart of the wilderness called Jungladesh. Upon arrival assisted check in at hotel. Visit Karni Mata Temple (Rat temple) inhabited by hordes of rats. Also visit Junagarh Fort and Camel breeding farm. Head to Jaisalmer, in the Great Indian Thar Desert. Architecturally, the city has a wonderful legacy of old buildings, united by the common use of local yellow stone and beautifully preserved due to the isolated location. Enclosed by an imposing sandstone wall, the fort stands on a hill 250 ft. high. Tour includes visit to the fort and havelies of Rajput Nobles and merchants. The most important sites are Patwon-ki-Haveli & Salim Singh–ki-Haveli. In the evening enjoy trip to the most picturesque Sam sand dunes. 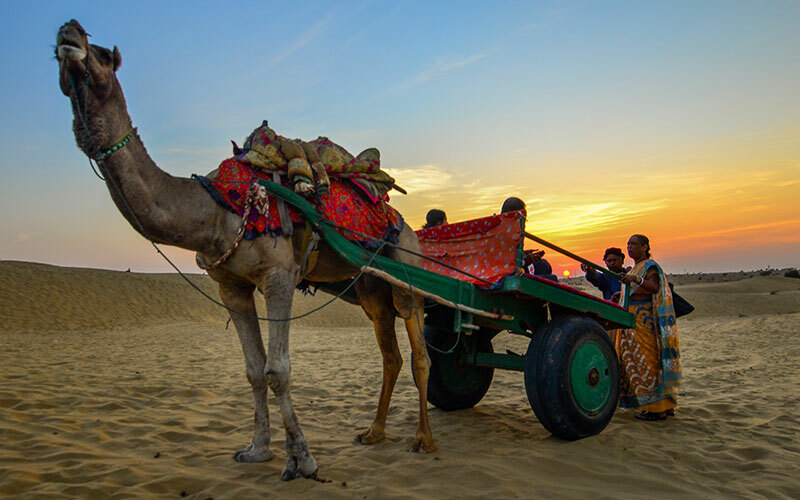 Various cultural programs are organized against the backdrop of these fascinating sand dunes along with a camel ride to view the sun set over the sand dunes. After relaxed morning drive to Jodhpur. The city was founded by Rao Jodhaji in 1459 A.D. The city was on silk route of the 16th century and hence was host to a number of travellers. Jodhpur is the second largest city in Rajasthan. The city tour of Jodhpur includes Meherangarh Fort, rising up a hilly scrap, which was built on the advice of a hermit, and it overlooks the city in the image of a long sentinel Jaswant Thada, the cremation ground of the rulers of Jodhpur dotted with cenotaphs Moti Mahal or Pearl Palace, which has exquisite, painted ceilings and walls Sheesh Mahal & Rang Mahal Palaces are also noteworthy with fine decoration enriched with inlay work and mirrors. Head for Udaipur the “City of Lakes” en route visit a group of Jain temples at Ranakpur which is, a unique example of Jain ecclesiastical architecture. The main Jain temple is Chaumukha or Four faced temple dedicated to Adinath and consists of 29 halls and 426 pillars full of sculptured decoration. No two pillars are alike here. Reach Udaipur and enjoy the boat ride on beautiful Lake Pichola. 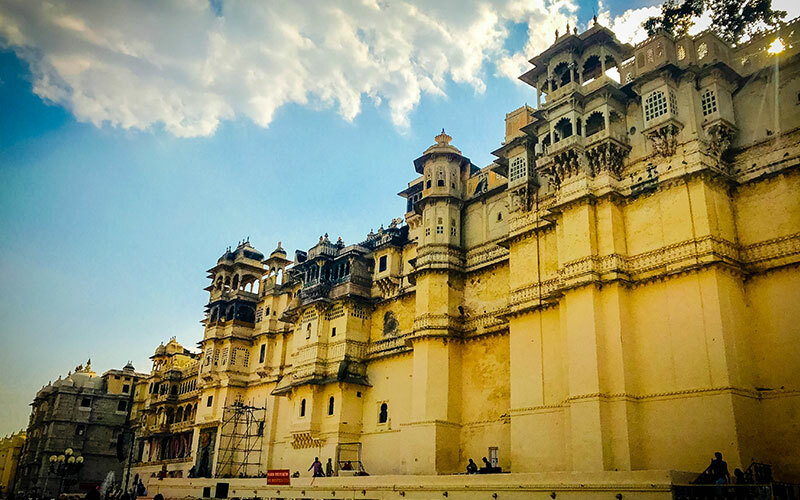 Visit the City Palace museum, where one can find rooms with mirrored walls and ivory doors, colored glass windows and inlaid marble balconies. Also visit the famous peacock courtyard, Sahelion-ki-Bari (the gardens of royal ladies, lay out with lush green lawns, kiosks, trees and beautiful fountains). Jagdish Temple is also an important site to visit. Later proceed to the local folk museum having beautiful peacock mosaics, splendid series of figures in mid 19 century. Leave for Pushkar this morning. On arrival visit the famous Pushkar lake and Hindu temples. Also visit Dargarh of Khwaja Moinuddin Chishti and Adhai din ka Jhopra. 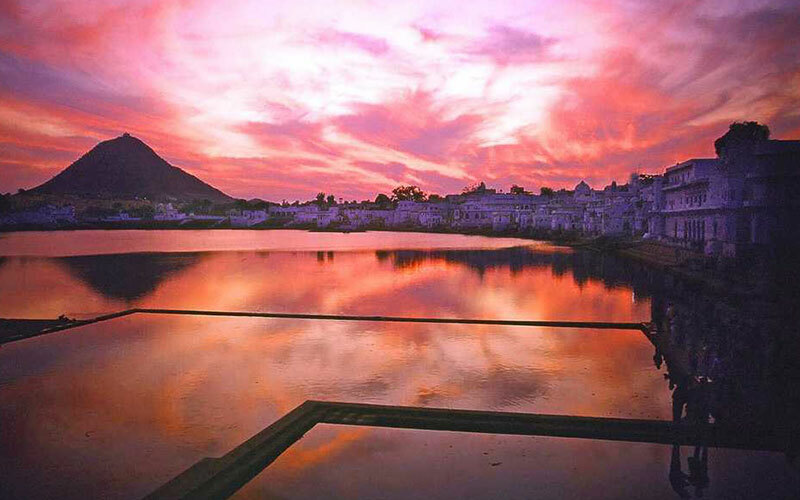 Visit the famous Pushkar Lake and Hindu temples. Day free to explore the fair activities. Pushkar fair is the largest livestock fair in the world. You can enjoy the various activities in Pushkar fair like Hot air balloon flights, Foot ball match, Adventure activity at Adventure Zone, Kite flying exhibition etc. Today we drive to Jaipur the capital city of Rajasthan. Enjoy a visit to Hawa Mahal (Palace of Winds) and City Palace museum containing three wings of Armory, Textiles and Artefacts. Spend some time in the colourful and crowded markets of Jaipur. In evening you will be taken for Rajasthani folk dance with dinner. Visit Amer Fort this morning and ascend to the fort on the back of a decorated Elephant. Also visit Jaigarh Fort where you can see world's biggest cannon on display. Both Amer and Jaigarh Forts hold the attractions of Rajput architecture. Enjoy a short rickshaw ride in Jaipur streets. Head to Agra and en route visit “The ghost city of Fatehpur Sikri”. Fatehpur Sikri is the best example of the culmination of Hindu and Muslim architecture. 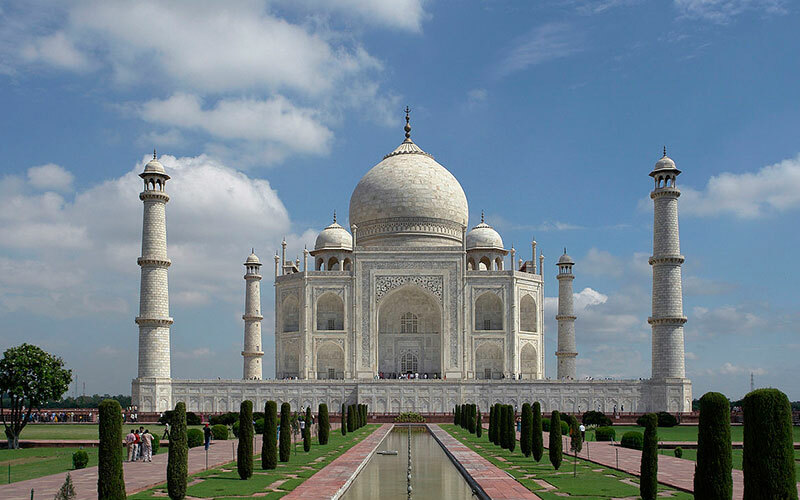 Upon arrival at Agra, check into the hotel and after wash and change visit the most beautiful Taj Mahal during sunset time. Visit Agra Fort and Sikandra Fort this morning. Later drive back to Delhi International airport to board your flight back to home. No credit card fee. All our group departure trips are free from online credit card bank charges. To book the trip you can pay instantly using your credit card at no additional cost. To pay click here.